Yet another concern about cancer causing agents and the effectiveness of sunscreens…The very product that we are using to protect our skin from harmful UVA and UVB rays. Not to be too alarmed. This information is still under investigation. A recent report on sunscreens by Environmental Working Group (EWG) raises some questions on the safety and efficacy of sunscreen products on the market. The report says out of 500 brands that were tested only 39 were recommended by EWG. The report warns consumers to stay away from sunscreens containing the Vitamin A compound etinyl palmitate, linking this ingredient to skin tumors and growth. “EWG has again flagged products with oxybenzone, a hormone-disrupting compound that penetrates the skin and enters the bloodstream. According to Dr. Baumann, there are no scientifically valid reports or studies that have shown that this is dangerous. She advisees, “that if you are pregnant, breastfeeding, have an increased risk of breast cancer, or want to be extra cautious about chemicals, avoid sunscreens with oxybenzone. An alternative that will not be absorbed into the body are sunscreens with zinc oxide such as Blue Lizard for sensitive skin. The bottom line: Sunscreens do not protect you 100%. 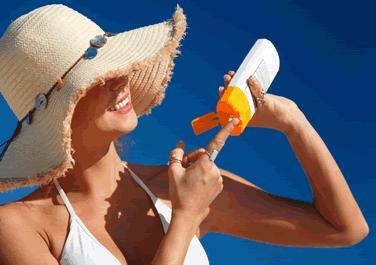 Don’t be fooled in thinking that you are getting the full SPF of any brand. Be smart. Wear hats, protective clothing and try to avoid the sun at peak hours. Don’t stop using sunscreens..
← Thinking about Plastic Surgery…Searching for Answers? this issue need to go through a lot of further investigation!! maybe this is also one of the reason why the percentage of people suffering from cancer is so alarming today! companies need to face all the possible cases that might be filed on them for producing such harmful products like this. i feel sorry for those who are suffering now on skin cancer for using some of these.